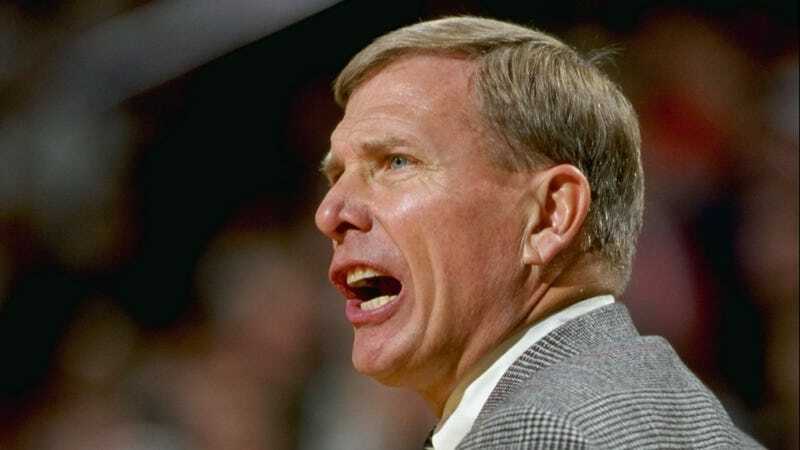 Former Baylor basketball coach and indescribably terrible scumbag Dave Bliss, just about as awful a sports human as has not (yet!) been found to have constructed a murder dungeon in his basement, has landed another basketball coaching job. As reported by the Las Vegas Review-Journal, he has been hired to coach boys basketball and serve as athletic director at Calvary Chapel high school in Las Vegas, in violation of all sense and reason. I wonder which part of his résumé sealed the deal. His 543-343 career win-loss record? His 8-11 record in the NCAA tournament? Probably it was not the time he falsely and repeatedly smeared 21-year-old murder victim Patrick Dennehy as a drug dealer—an almost unimaginably cruel bit he has repeated as recently as this past March—to throw NCAA investigators off his own amateurism-rules violations. On the other hand, that bit evidently did not disqualify him, either, so probably Calvary Chapel should just be boarded up and abandoned, if not razed to the ground by parents of its student athletes. Whatever did the trick, Bliss—who under absolutely no circumstances should be entrusted with a position of authority over anybody for the entire rest of his life—will be coaching and managing even younger and more vulnerable basketball players now. Pretty much any other living person would make a better choice for this job. An old-fashioned cigarette vending machine with the word “Coach” spray-painted on it would be a better choice for this job. Letting the teens run their own athletic department and basketball practices would be a better choice for this job. By definition, a person who will hire Dave Bliss to coach teenage basketball players and run an athletic department is not qualified to hire anyone to do anything. How does this happen? In most alternate universes, Dave Bliss is in prison. In some of them he is a destitute outcast. Those ones are less stupid than this one.